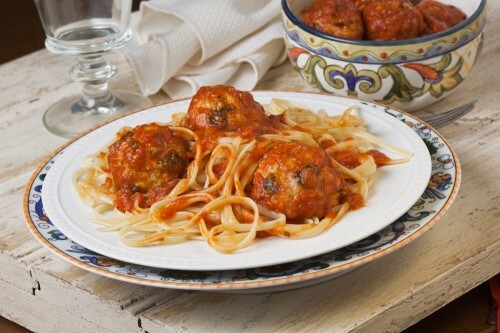 I used to decide between browning meatballs in a skillet or in the oven, then fussed over keeping them round, not flat on one side – as if a flat-sided meatball isn’t ok. Then I was at a potluck with chef colleague Linda Carucci who served her favorite meatballs that she never fries or bakes. What? She always cooks them in the sauce. Simply use a lean ground beef or turkey (I prefer the lean turkey, not white turkey meat which can be too dry), then simmer in a marinara sauce. For this recipe I added raisins, in southern Italian style for a sweet surprise with tangy tomatoes. You can use your favorite meatball recipe –meatball recipes tend to be personal– and just add a handful of raisins. Some pine nuts too if you want to be more Italian. The best part is no browning or baking and no extra pans to wash! Serve on top of spaghetti or tuck in a sandwich roll. Combine all ingredients except marinara in a bowl. Mix well with a spoon or hands. Shape meat into 1-1/2-inch balls, to make 16 meatballs. Heat marinara sauce in a medium (about 4 quart-size) saucepan. Place meatballs in the sauce; they should be in a single layer and mostly covered with sauce. Cover and simmer on medium-low heat 20-25 minutes or until done, gently turning meatballs once or twice so they cook evenly. Serve with pasta or on a French roll sandwich. Original recipe by Rosemary Mark for Sun-Maid. Photography and styling by Kelly Burgoyne. Puree the tomatoes and their juices in a food mill, blender, or food processor, just until there are no chunks. In a non-reactive 6-quart Dutch oven or saucepan, bring the tomatoes to a boil over medium-high heat. Reduce the heat and cook at a steady simmer, uncovered, until the puree has thickened to a sauce consistency (thick enough to coat the back of a wooden spoon and retain the track of your finger after you drag your finger across the spoon), 3 to 5 minutes. Slowly stir in the olive oil. Add the basil, garlic, salt, and pepper and stir to combine. Add meatballs and cook as above. You can find Linda teaching at Ramekins in Sonoma and Draeger’s Cooking School. I love the idea of simmering them in the sauce! I know it sounds crazy, but I don’t usually make meatballs at all, and I know Myles would love some. And I love that you put raisins in your meatballs. That’s a wonderful idea!! I know what you mean, I used to think meatballs were a bit of a bother too. But not made this way! Of course currants are a nice option instead of raisins though more people have raisins on-hand. Sun-Maid will be happy to hear that!